"In our little journey up to the Grande Chartreuse, I do not remember having gone ten paces without an exclamation that there was no restraining: Not a precipice, not a torrent, not a cliff, but is pregnant with religion and poetry." Chartreuse offers magnificent walking. It is not the exhilarating walking of the Chamonix glaciers, nor the long, lonely multi-day treks offered by the Pyrenean hills, but nevertheless, in its own way, it is as fine as both. It was justifiably described by Stendhal as "l'émeraude des Alpes" - the emerald of the Alps. It has four tops over 2,000 m.
The area is best suited for day walks, rather than for back-packing. This is largely because the dominant topography is one of long, but narrow limestone ridges, which does not lend itself to circular tours. Moreover, being limestone, there is little water in the hills, and the valleys are too populated for wild camping. Having said that, there is the circular Tour de Chartreuse which, although taking advantage of the few mountain huts available, does tend to finish each section in a community. Typically, a walk will start in the forest, often to the accompaniment of a stream which will be found later emerging from a spring or cave. The forests are very beautiful, and fairly damp and cool, but with little visibility. Getting through the forest can be a long process, but the paths are usually well made and easy going. The transition from forest to meadow is foreshadowed by tall pines being replaced by smaller spruce and dwarf birch, but nevertheless, tends to be abrupt. The emergence into the sunshine of the alpine meadows, often with the heat being reflected off the limestone cliffs above, is always welcomed. In the spring and early summer, up to mid-August, it is the flora which overwhelms. Above the meadow are the cliffs protecting the plateaux above. These can be very dramatic, rising vertically for over 300 metres, and at first sight seem to be insurmountable. If there are any exposed or scrambly sections, they are likely to be in this section. Some of the routes through the cliffs are positively exciting. Above them are the plateau areas. Although there are positive mountain summits in the area, such as Chamechaude and Dent de Crolles, these are the exception rather than the rule. Generally, one surmounts the cliffs to find high-altitude, long synclinal valleys overlooked by steep ridges. But there is no feeling of anticlimax, for these valleys are exquisite. The sides are dominated by large expanses of steep limestone pavement, and the floors are covered with a mixture of dwarf woodland, and meadows. They are a delight to wander through. It is usually possible to descend via an alternative route back to the starting point. Many walks in Chartreuse include a section of sangle. 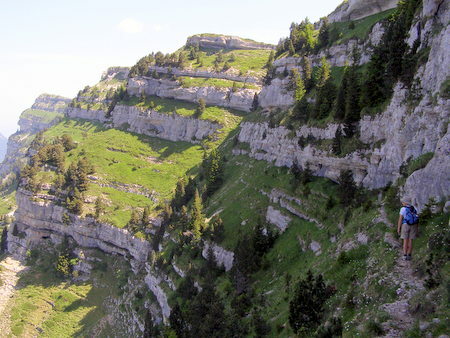 The cliffs in Chartreuse are often separated by steep grass terraces, and the sangle paths follow these terraces, sometimes because they are the only feasible way up, and sometimes just for the hell of it. These paths typically follow a thin line beneath upper cliffs, and have a steep grassy slope falling away towards lower cliffs, and they can be very exposed. Whilst they can be traversed with safety by those who have a reasonable head for heights, it would be difficult to protect those who are unhappy in such situations. The grades given to routes in this guide do take into account the exposure factor. Over the past few years, the PNRC have been undertaking a program of footpath repair, and signposting. Both are very positive steps, but it does mean that new signposts may appear, and old ones removed since a walk was described. The fixed aids on some of the steeper and more exposed sections of the popular paths are also being replaced and extended. This can make a walk easier than indicated. A couple of minor warnings. Firstly, forestry is much more mechanised than it used to be, and tracks are now created rather brutally in the lower woods. These sometimes obscure the traditional paths, and the routes described here may require interpretation if the machines have been there since the author. It is unfortunate that the PNRC aren't influencing the forestry activities a little more - especially as tourism is probably worth a lot more to the local economy than the forestry. Secondly, on hot sweaty days, you can expect to collect an entourage of flies on your ascent. Most of these are harmless, but be aware of the horse flies - the size of sparrows with the bite of a crocodile... It's also worth having a tick remover back at base. I don't expect anybody to agree with me! "This web site is intended as guidance for the wise, not for blind obedience by fools." Two gradings are used to classify the walks: the first is used as an indicator of the difficulty, and the second of the quality. Both gradings are inevitably subjective, as one person's exposure may be another person's view, and one person's scramble may be another person's rock climb, but it is hoped that they do have a consistency. It should be noted, however, that the author cannot take responsibility for other people's decision making in the hills. This web site is intended to serve as guidance for the wise, not for blind obedience by fools. The difficulty is graded 1, 2, or 3. Grade 1 indicates general mountain terrain, the type that you will find on any typical British hill. Grade 2 is used where the walk contains sections where some scrambling is required, and / or there is some exposure encountered. Striding Edge and Tryfan would probably merit such a grading. Grade 3 is used where the scrambling may be awkward, or where exposure becomes a significant factor. The Anoch Eagach in Glen Coe, or many of the non-climbing sections on the Cuillin Ridge would qualify as Grade 3. In Chartreuse, however, the more difficult sections tend to be very short. The descriptions do highlight those sections which were considered to merit an elevated grading. The quality is graded from one star (*) to three stars (***). Such a classification is even more subjective than the difficulty, and such is the quality of the walking in the area, it is difficult not to give top marks to everything! However, the walks described are a selection, and one star walks have been excluded. Two types of timings are used in the descriptions. The timings between landmarks are based on steady walking, and are intended to be of help with navigation. The total timings for the walk, and for the ascent and descent are intended to indicate elapsed times, inclusive of meal breaks, and the occasional break to rest the legs, take a photograph, or identify a flower. These are not intended to be super accurate, and have been rounded up or down as the whim dictates. For the shorter walks it means that you have more time available to dally and enjoy your surroundings. Providing you set off at a reasonably early hour, all walks described can be completed in time to enjoy a late afternoon beer at your favourite café. "Essential items of navigation equipment are the IGN 1:25,000 map, a compass, and the ability and willingness to use them both." Assuming you are walking between June and September inclusive, you need to take the same sort of equipment as you would on British hills in summer. When the weather is good, it can be hot, although one can find a chilly breeze on the ridges. Poor weather tends to be established by the early morning, so if you really want to cavort on the high tops in wet and cold conditions, you can make sure that you're properly prepared. Clothing should be light-weight. For the warmer days shorts, t-shirt, and sun hat will suffice, although we also take a spare shirt, and a light-weight wind-proof / shower-proof jacket. For the cooler days, trousers and a couple of layers for the chest are adequate. Light-weight walking shoes with a good sole are well-suited to the terrain. Thunderstorms with heavy and cold rain are not uncommon in the late afternoon, but at the very worst you should be on your way down by then so light-weight waterproofs are adequate. Gaiters are not needed, but we do take gloves and a warm hat (although they rarely see the light of day). Essential items of navigation equipment are the IGN 1:25000 map, a compass, and the ability and willingness to use them both. If one of the party is a little unhappy with scrambling, a short length of 8 mm rope will be useful for providing that extra bit of confidence. A decent head torch is useful for exploring the odd cave, and for getting down after dark if you have under-estimated a walk. We are not devotees of walking poles, or of the incessant click-clack that accompany them, but I suspect that having to manage two on the sangles and scrambles would be positively dangerous. Water is important - there are few places to replenish your bottle in the hills, so you should take at least a litre per person. Some food, a camera, and a decent alpine flower book should fill up the remaining space in your small rucksack. Most of the routes described in this guide are waymarked. The waymarking may be formal, such the red and white paint markings used on the grandes randonnées, and yellow markings on those marked by the PNRC, or they may be informal. The formal ones follow a strict code (described here), which should be understood. The markings are typically found on the limestone pavements, on boulders, and on trees, and should be noted wherever relevant so you can backtrack to the last one if you go off route. The formally marked paths also tend to be well sign-posted these days. Note that many of the routes described in this guide may follow formally marked paths for some distance, before heading into remoter areas - sometimes along a path waymarked with a cross indicating 'Not this way'. The other routes usually, but not always, have informal markings - painted blobs in a variety of colours, often faded. These tend to be minimal, and usually only when there may be doubt about the way on. Cairns are also sometimes used to indicate the way. Waymarkings, or no waymarkings, you should always be vigilant about looking for the main way on. If something silly bars the way, check that the path hasn't actually avoided it before blundering up it. When crossing rocky ground, follow the brown discolouration made by previous feet. Route finding becomes a lot easier once you get your eye in. Some of the upland flocks of sheep are accompanied by large guard dogs, usually 'patous' or Pyreneean mountain dogs. These began to be introduced about 2005 to protect the flocks from wolves that were moving into the area. These dogs can look formidable, but they don't pose a threat to walkers exhibiting common sense. Firstly, try not to walk through a tightly grouped flock of sheep. If the sheep are subsequently scattered, any dog that might be around may think that the sheep are being threatened and react accordingly. Secondly, if you are approached by a dog, stand still and talk gently to it (any language will do!). It will probably come up to you and take a sniff - feel free to offer the back of your hand but don't make any sudden movements. After a few seconds it will decide that you are no threat, and return to its duties. Do not shout, run, make any other sudden movements, or raise your walking poles. The presence of patous is often signalled by the presence of warning signs. Much of Chartreuse is a highly protected nature reserve, and if you are quiet when walking, you will almost certainly catch glimpses of some of the wild life. In the forests deer and red squirrels may be seen, and on the upper forested slopes, you will probably disturb the extremely agile Carthusian chamois. Mouflons were introduced in 1967, but we have yet to spot any. The marmotte was reintroduced in the 1940s, and their burrows are now a common sight alongside the paths beneath the cliffs. You will often hear their alarm shrieks, and catch glimpses of them as they run for cover. The presence of breeding populations of both lynx and wolves have been confirmed, but they are unlikely to be spotted. In the valleys, the softly mewing buzzard is a common sight, and if you're lucky you will see golden eagles in the high mountains. The whip lash calls of the Alpine chough can often be heard echoing round the cliffs, and you will inevitable have to share your lunch with a couple of them. Ravens are also common. On the upland prairies the alarm chattering of the ring ouzel is a common accompaniment, and the eye will often be diverted by the red flash of a black redstart's rump as takes to the air. Lower down, dippers will be seen in the river gorges.